Judy Dwyer is an 8th generation Australian, with 3 of her forebears arriving aboard the ‘First Fleet’: 2 convicts and 1 Royal Marine. The Marine and a convict married and their granddaughter married Richard Staight of Tewkesbury. 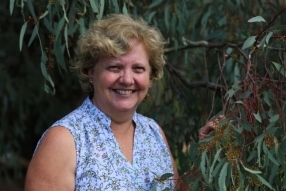 Judy is a proud member of the ‘Fellowship of First Fleeters’ Association in Australia and is currently the Secretary of the Lachlan Macquarie Regional Chapter of this Association. She grew up in New South Wales and obtained a university degree in Early Childhood Education. Judy and her husband, Chris have four adult children and 1 grandchild. Judy continues to work part time as a specialist teacher within an Early Childhood Intervention Program. Family history is now a 30 year old addiction. This year Judy has returned to University as an external student where she is currently undertaking a degree in Family History. When researching information regarding her great-great-great grandfather, Richard Staite, a convict who was transported to New South Wales, she discovered that he was originally from Tewkesbury. Judy encountered many brick walls with Richard, particularly with his surname, which has been spelt in numerous ways. It was during this research that she emailed John Dixon who alerted her to the notice within the Tewkesbury Abbey Church Registers regarding Richard. Judy couldn’t believe her luck! Since then the brick walls have been demolished and the story of the Stait family has evolved. Tewkesbury has a special place in Judy’s heart. She has had two visits to Tewkesbury recently, the first in 2012, then returning last year. She has had an absolute ball discovering the places where her ancestors walked and lived. The town has a wonderful ‘feel’ to it for her – almost ‘like she’s home’. The people they have spoken to throughout their visits have been very warm and friendly, which adds to the appeal of the place. Judy’s hope is to revisit one day in the near future-hopefully when the President is in residence so they can actually meet.